A reliable source for Spark Arrestor information and a resource for accessing leading Spark Arrestor and suppliers. Spark Arrestor A spark arrestor can be defined as an element that intercepts flammable debris from combustion sources in order to prevent fires. Early spark arrestors, commonly designed as spiral shaped cones, were employed in steam locomotives to separate embers from the exhaust through centrifugal force. When it comes to engines, there are two main types of arrestors- centrifugal and screen. 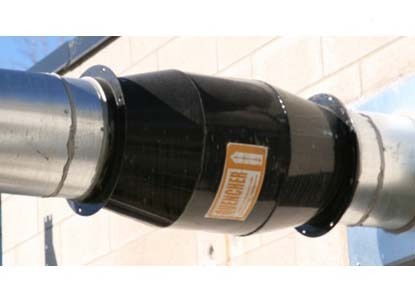 Centrifugal spark arrestors use baffles or stationary vanes to catch flammable debris using centrifugal force. These are commonly used in agricultural and construction equipment like combines, bulldozers, and tractors. Screen arrestors, on the other hand, are much more simple and used in smaller engines and also often in the tops of flues on buildings. These consist of a metal mesh that traps large particles and prevents them from leaving the exhaust system. In addition to their use with engines, spark arrestors are also used in conjunction with dust collecting systems in the industrial setting. These are effective in preventing fires and explosions by extinguishing, cooling, and rerouting sparks and burning embers that are caught in flow of dust collection and ductile systems. These are essential in settings where grinding, plasma/laser cutting, welding, torch cutting, and flame spray occur. There are a few different designs of spark arrestors and manufacturers are often producing newer and more effective models. Some of the newest technologies are designed to channel flammable debris in a circulating manner, which allows the embers and sparks to lose more energy before they are deposited in a safe location.